Japanese food and Filipino food take to each other like ducks to water. After all, we both have rice-based diets so it’s not a surprise that our favorite ulam (viands eaten with rice) are wonderful with Japanese rice dishes. Take the onigiri, for instance. Pork Adobo + Onigiri? Perfect! 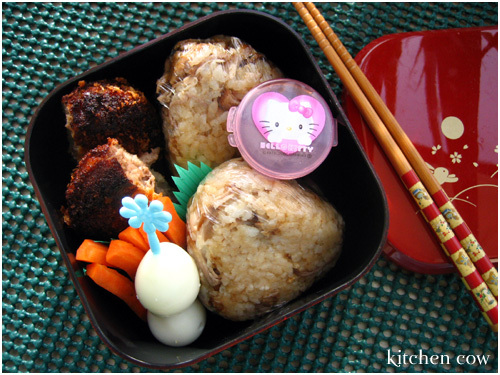 â€¢ Adobo Onigiri.I have to admit, the idea isn’t mine originally. A few months ago, Ministop, a chain of convenience stores, came up with Samurice, onigiri mixed with various meat goodies. They had variants like sisig, meatloaf, barbecue, and of course, adobo. Now, despite the non-descript mushy rice they used, I liked their Adobo Samurice because it hit the spot whenever I had a craving for onigiri. Still, I was probably the only person who used to buy it, so it was pulled out of their shelves eventually. Would I let that stop me? Of course not! Instead, I decided to make a meatier, more flavorful version with koshihikari rice even. I asked my mom to make her next batch of adobo extra big so I had lots of leftovers to experiment with. Instead of making just one or two onigiri, however, I decided to make many and just freeze them. Good idea, no? â€¢ Menchikatsu. A tonkatsu like breaded dish, Menchikatsu is made of minced meat–either pork or beef–that’s mixed with onions and spices then formed into patties before breading. It’s a katsu-hamburger of sorts, I guess. â€¢ Hello Kitty sauce cup of Tonkatsu sauce for the Menchikatsu. your entries are always appetizing. yumyum! i didn’t like the samurice of mini stop. thought it was too dry. baka na-overheat. Thanks Tony Lou! The samurice I’ve tried weren’t dry…but they were too mushy. I guess yours got overheated? I’ve had times when they didn’t heat it enough so it was still cold and partially frozen at the center. Yucky! But I was too lazy to walk back to Mini-Stop, hehe. Just made sure to check that they nuked it properly next time. An officemate bought it for me, she says it’s from St. Francis Square. One of those bargain stores / Asian supermarkets at one of the upper levels. I have a set of animal themed ones too, from Co-op (ask Nina) but it’s been a long time since I last saw them there.